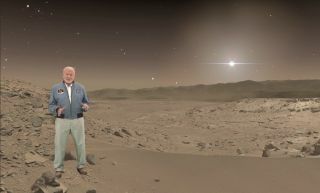 A hologram of Buzz Aldrin will lead a tour of the Red Planet in the new exhibit "Destination: Mars," coming in the summer of 2016 to the Kennedy Space Center Visitor Complex. "We're excited to give the public a chance to see Mars using cutting-edge technologies that help scientists plan Curiosity's activities on Mars today," Jeff Norris, project manager for "Destination: Mars," said in a the statement from the agency. "While freely exploring the terrain, participants learn about processes that have shaped this alien world." Exploring the Martian surface via virtual reality is something NASA scientists already do with some regularity, according to a statement from the agency. "Destination: Mars" is adapted from a pilot program called OnSight (for which Norris is the program manager), which lets scientists "walk" on Mars, and get a sense of which formations or areas the Mars Curiosity Rover should explore next. "OnSight makes the whole process of analyzing the data feel a lot more natural to me," Abigail Fraeman, a science team member for NASA Mars Curiosity Rover, said in the statement. "It really gives me the sense that I'm in the field when I put it on. Thinking about Martian geology is a lot more intuitive when I can stand in the scene and walk around the way I would if I were in the field." Fraeman and a colleague used OnSight to "identify the transition point between two Martian rock formations, which they would like to study in further detail," the statement said. The new exhibit at KSC uses Microsoft's HoloLens, which have only just been released to app developers (they currently cost $3,000), and are not yet on sale to the public. The high price tag will apparently buy a cutting-edge VR experience. Microsoft's pilot app for the HoloLens is called Galaxy Explorer (it was chosen by popular vote), which will apparently let users explore the Milky Way. The company has been documenting the app's development in a Web series. When the goggles finally hit the market, users will be able to take a virtual tour of the galaxy from home.